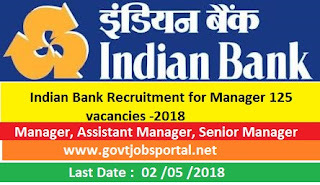 Application are invited for filling up 400+ vacancies of Senior Relationship Manage, Territory Head, Operations Manager – Wealth, Services and Control Manage by Bank of Baroda Recruitment 2018 Through open competition. 1).As a part of the Bank’s ambitious strategy to launch Wealth Management Services to HNI/UHNIs, Bank of Baroda is looking for Wealth Management professionals with proven skills and requisite experience in wealth management. 3).Before applying, candidates should ensure that they fulfill the eligibility criteria for the post as on the date of eligibility. Short-listing and interview will be purely provisional without verification of documents. Candidature will be subject to verification of details/documents when the candidate reports for interview if called. 4).Online Registration of Application commences from 16th April 2018 and closes on 06.05. 2018. 5). Candidates fulfilling the following eligible conditions may Apply in the Performs given below by Bank of Baroda. Total Vacancies:- 444 jobs . Age Limit:- Max. age limit between 23 to 45 Years . 1). Graduate from Government recognized University or Institution. Preference will be given to candidates having MBA or equivalent degree from reputed Colleges. 2). Graduate from Government recognized University or Institution. 3).Minimum 3 years of experience as a Relationship Manager in Wealth. Management with leading Public / Private / Foreign Banks / Broking / Security firms. The Link to the online Registration of the application Has been hosted on the website www.bankofbaroda.co.in/careers.htm. It should be kept active till completion of this recruitment project. Bank may send call letters for GD, interview etc. through the registered email ID. In case, a candidate does not have a valid personal email ID, he/she should create his/ her new email ID before applying Online. Under no circumstances, he/she should share/ mention email ID to/ or of any other person. Payment in Online Model: Candidate also have the option to pay the fees online through net banking / Debit Card /Credit Card ).The Online Payment Option will be Available At the online application ,before the submit button. 1).Candidates are advised to carefully fill in the online application themselves as no change in any of the data filled in the online application will be possible/ entertained. 2). The name of the candidate / father name / spouse name etc. should be spelt correctly in the application as it appears in the certificates/mark sheets/ other documents. Variation if any with the originals cannot be corrected later and will also disqualify the candidature. 3). Candidates should first scan their latest photograph and signature. Online application will not be registered unless candidate uploads his / her photo and signature as specified. 4. The name of the candidate and his/ her father/ husband etc. should be spelt correctly in the application as it appears in the certificates/ mark sheets. Any change/ alteration found may disqualify the candidature. 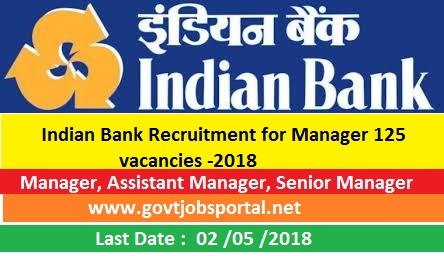 Application are invited for filling up 125 vacancies of Manager, Senior Manager, Chief Manger, Assistant Manager in the pay Scale of Rs 23700/- to 59170/- by Indian Bank Recruitment 2018 Through open competition. 1).Online Registration of Application commences from 10th April 2018 and closes on 02.05. 2018. Total Vacancies:- 125 Recruitment . Age Limit : Max. age limit between 23 to 45 Years . Post Graduate Degree in Electronics/Electronics & Instrumentation /Computer Science /Information Technology/Computer Application or Graduate Having Passed DOEACC ‘B’ level. Minimum 5 years experience of Handling a credit desk in Banks / Corporate / PSU/ Rating agencies It is desirable to have hands on experience in assessing investment proposals / Fixed Income and Structured Instruments. Scan their photograph and signature ensuring that both the photograph (4.5cm × 3.5cm) and signature adhere to the required specifications as given in Annexure to this Advertisement. Signature in CAPITAL LETTERS will NOT be accepted. Have a valid personal email ID, which should be kept active till the completion of the Recruitment Process. Bank will send call letters for the Examination and other communication only to the registered e-mail ID. Under no circumstances, a candidate should share e-mail ID with any other person. In case a candidate does not have a valid personal e-mail ID, he/she should create his/her new e-mail ID before applying on-line and must maintain that email account. 1.Candidates are advised to carefully fill in the online application themselves as no change in any of the data filled in the online application will be possible/ entertained. 2. The name of the candidate / father name / spouse name etc. should be spelt correctly in the application as it appears in the certificates/mark sheets/ other documents. Variation if any with the originals cannot be corrected later and will also disqualify the candidature. 3. The candidates shall produce the original experience certificate at the time of Interview for at least the minimum number of years as required from one or more number of employers where they have gained the experience. The certificate produced by them shall state the period for 19 which they had worked in the Department or Domain concerned. Teaching / Training experience will not be considered. Final decision taken by the Bank with regard to acceptability of the experience certificate submitted by the candidate rests with the Bank and is binding on the candidates. (You will get more information in employment News paper dated on 07/04/.2018 Page no.(20).) Visit the official website for more information. 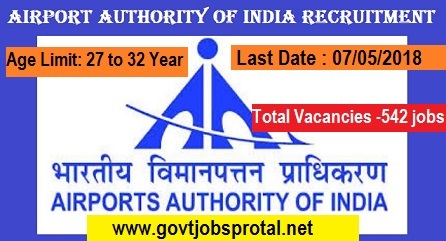 Application are invited for filling up 542 vacancies of Airports Authority of Indian in the pay Scale of Rs 40000/- to140000/- by 2018Airports Authority of Indian Recruitment Through open competition. Airport Authority of Indian AAI a Government of Indian Schedule –‘A’ Mimi Rtna –Category -1 Public sector Enterprise , Is entrusted with the responsibility of Category ,Upgrading ,Maintaining and managing Civil Aviation infrastructure both on the ground and Air Space in the country AAI Manages 129 Airports, Which include 23 international Airport 8customs Airport 91 Domestic Airports and provides Air Traffic Management Services over entire Indian Air Space and Adjoining Oceanic areas with ground installations at all Airports and 25 other Location. 1).Online Registration of Application commences from 07th April 2018 and closes on 07.05. 2018. Total Vacancies:- 542 Recruitment . Age Limit : Max. age Between 27 to 32 Years . Application Are Invided from willing and eligible Engineering Graduates Possessing. 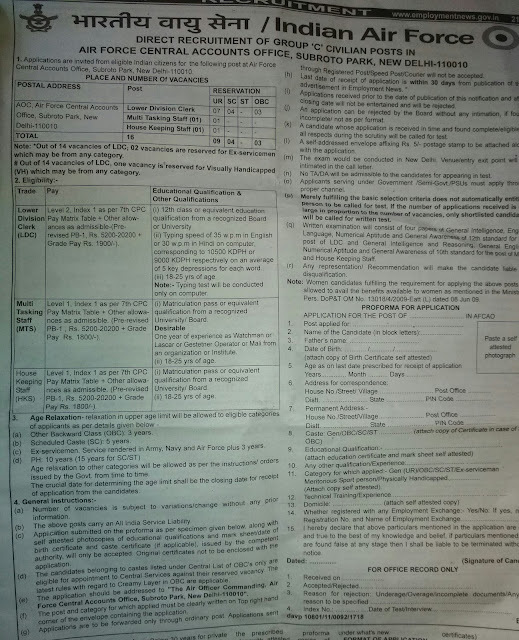 1).Before applying for the post, the candidate should ensure that he/she fulfills the eligibility and other norms mentioned in the Advertisement. Furnishing of wrong/false information will be adisqualification and AAI will not be responsible for any consequence of furnishing of such wrong/false information. 2).The essential qualifications acquired through distance learning/part time or equivalent qualifications such AMIE/Certificate etc. shall not be considered. (You will get more information in employment News paper dated on 07/04/.2018 Page no.(25).) Visit the official website for more information. 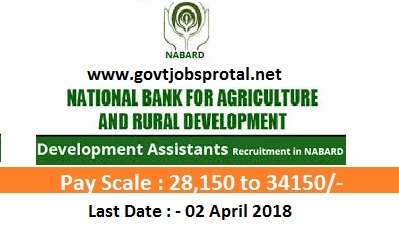 Application are invited for filling up 92 vacancies of Assistant Manager in the pay Scale of Rs – 28,50/- to 34,350/- by National Bank for Agriculture and Rural Development Can Apply Online 2018 Recruitment Through open competition. Total Vacancies:- 92 Recruitment . Age Limit : Age in between 21 to 30 Years . The Link to the online Registration of the application has been hosted on the website www.nabard.org No other means/ mode of application will be accepted. The application form should be filled in English only. d).Before applying online, candidates should - i. Scan their photograph and signature ensuring that both the photograph and signature adhere to the required specifications as given under “Guidelines for photograph & signature scan and upload”. Application are invited for filling up Six vacancies of Technical Assistant, Senior Technician Lab in the pay Scale of Rs – 29,600/- to 92,300/- by Department of Agriculture Cooperation And Farmers Welfare 2018 Recruitment Through open competition. 1).Online Registration of Application commences from 09th March 2018 and closes on 16 April 2018. Total Vacancies:- 6 Recruitment . Age Limit : Age in between 18 to 27 Years . Diploma in Agricultural Engineering From a recognized institute or university with five years experience in the relevant filed. 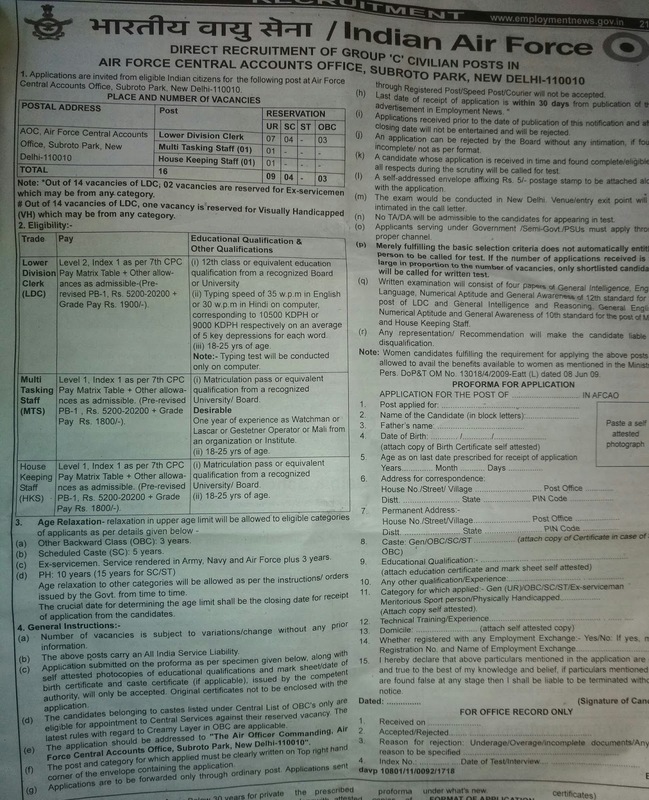 The Interested and eligible candidates may apply on plan paper with self attested copies of testimonials of age, education qualification experiences castes OBS Non –Creamy Layer etc Issued by respective competent authority full bio- date containing Name in full block letters fathers name date of birth as per class 10th Certificates Nationality, Religion ,caste with supporting document ,and Home address for communication along with PIN Code So as reach to the Director southern region farm machinery Training and Testing Institute , Tractor Nager, Geraldine -515731,Distt : Anantapur with 45 days from the date of issue of this advertisement. Industrial Training Institute ITI Certificate in Mechanic Agricore Machinery or mechanic motor vehicle or Mechanic Tractor or mechanic diesel engine or electrician trade: Five Years Experience in operation and maintenance of tractor or heavy transport vehicle or heavy earthmoving equipments or electrical maintenance and Possessing Valid Driving licence of right and heavy duty vehicle and tractor. (You will get more information in employment News paper dated on 03/03/.2018 Page no.(18).) Visit the official website for more information. 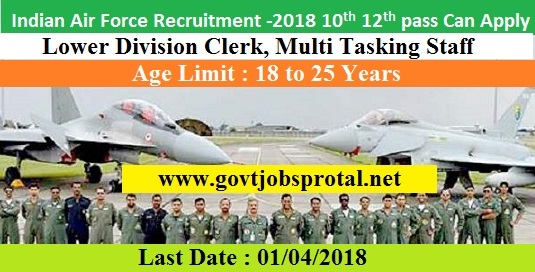 Application are invited for filling up 16 vacancies of Lower Division Clerk, Multi Tasking Staff, House Keeping Staff in the pay Scale of Rs – 5,000/- to 20,020/- by Indian Air Force 2018 Recruitment Through open competition. Application are Invited from eligible Indian Cititizens for the following Post at Air Fours Central Accounts Office, Subroto Park, New Delhi -110010. 1).Online Registration of Application commences from 03th March 2018 and closes on 01th April 2018. Total Vacancies:- 16 Recruitment . a).12th Class or equivalent education Qualification From a recognized Board or university. b) Should have passed Matriculation (10th) or an equivalent examination with Science Subjects from recognize Board. 1. Number of Vacancies is subject to Variations /Change without any prior information. 3). The Post and Category for which applied must be clearly written on top right hand corner of the envelope containing the application. (You will get more information in employment News paper dated on 03/03/.2018 Page no. (21) Visit the official website for more information. Application are invited for filling up 35 vacancies of General Manager, Addl General, Additional General Manager in the pay Scale of Rs – 60,000/- to 90,000/- by NBCC Indian Limited Recruitment 2018 Recruitment Through open competition. NBCC Indian Limited formerly known as National Buildings Construction Corporation Ltb is a Premier Government of Indian Nirvana Public Sector Enterprise under the aegis of Ministry of Housing and under Affairs Listed With Both the Stock Exchange ,The Company’s unique Business Model Has Today, Made its Stand out as largest PSE In the Construction Sector and leader with more than INR 75000 Cores Order Book. The Company Has Registered a Substantial Growth in top line During FY 2016-17 as Compared to previous year. 1).Online Registration of Application commences from 03th March 2018 and closes on 01/04/ 2018. Total Vacancies:- 145 Recruitment . Age Limit : Age in between 22 to 39 Years . a).Full Degree in Civil Engineers Or Equivalent From Govt Recognized University. d) Three Year Diploma in Electrical Engineering. The Relevant Link for online application will be Made available From on 24.02.2018 under the head Career within HRM On NBCC Online Submission of Application Will be Open for 30 dayes from the Day of start of Appplication. 2. The recruitment of the above mentioned posts will be subject to the approval of UGC & University of Delhi. (You will get more information in employment News paper dated on 01/04/.2018 Page no.(10).) Visit the official website for more information. 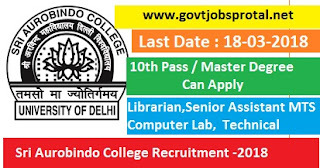 Application are invited for filling up 35 vacancies of Librarian, Adminstrative Officer Senior Assistant, Professional Assistant Senior, Technical Assistant, Professional Assistant, Multi Tasking Staff, Assistant MTS Computer Lab in the pay Scale of Rs – 15,600/- to 39,100/- by Sri Aurobindo College Recruitment 2018 Recruitment Through open competition. 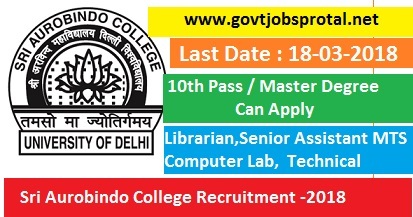 Online applications are invited for the following permanent Non-Teaching posts of the college UR- Unreserved, OBC- Other Backward Class, SC- Scheduled Caste, ST- Scheduled Tribe, PwD- Person with Disabilities, VHVisually Handicapped, PH – Physically Handicapped, OH- Orthopedically Handicapped, HH- Hearing Handicapped. College reserves the right to fill or not to fill the above mentioned post(s). The number of posts Unreserved/reserved may increase or decrease as per DU/ UGC rules. Eligibility criteria and qualifications are as per the University of Delhi/ UGC norms. 1).Online Registration of Application commences from 03th March 2018 and closes on 18 March 2018. 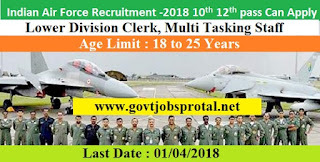 Total Vacancies:- 33 Recruitment . Age Limit : Age in between 27 to 35 Years . a) A Master’s Degree in Library Science/Information Science/Documentation Science or an equivalent professional degree with at least 55% marks (or an equivalent grade in a point scale wherever grading system is followed) and a consistently good academic record with knowledge of computerization. b) Qualified in the national level test conducted for the purpose by the UGC or any other agency approved by the UGC. c). Good academic record plus Masters’ degree with at least 55 % of marks or its equivalent grade of B in the UGC seven point scale (5% relaxation in marks for SC/ST category). d).Should have passed Matriculation (10th) or an equivalent examination with Science Subjects from recognize Board. 1. As per directive of the University of Delhi vide its OM No. Estab. IV/047/2016/01/RR-OM dated 02.12.2016, it has been decided to discontinue interviews for recruitment to all Group ‘C’, Group ‘D’ (which are now reclassified at Group ‘C’) posts and for Non-Gazetted posts of Group ‘B’ Category and all such equivalent posts in the light of DOPT OM No. 39020/01/2013-Estt (B) – Part dated 29.12.2015. Accordingly, selection for the above posts shall be based on performance of the candidates in the written test / skill test / practical test, etc. (You will get more information in employment News paper dated on 03/03/.2018 Page no.(10).) Visit the official website for more information.